It’s a bit back to front I admit, but after the dust settled on the week-long photo-opsy of the Gretawire picture and while putting together a summary of sorts to close the book on the subject, yet another puzzling observation surfaced, this time popping out at me from *a comment previously overlooked in my endeavour to deal with just the photographic evidence on hand. But I believe the train of thought evoked by this comment belongs at the front of this piece rather than at the end as it speaks directly to the validity of Sarah Palin’s public record as a runner, and I think it would benefit anyone reading the summary to be aware of these facts – and they are documented facts – while digging through the preponderance of anomalies discovered in photographs the Palins offered as proof positive that Sarah earned her silver medal at the Storm Lake Running Club on 04 September 2011. For the record – there is no public record of Sarah Palin being an avid, dedicated runner capable of setting records and winning top medals. 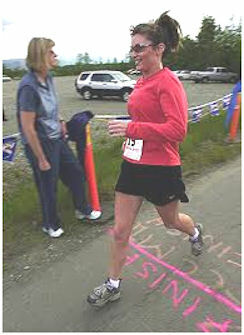 Among Alaskans, Sarah’s name is associated with a marathon remembered as Running with the Devil but the remembered date varies between 2001 and 2003. I’ve performed searches on archived run results from 2000 to 2004 and neither her married nor maiden name appears in official results of archive searches associated with this event. 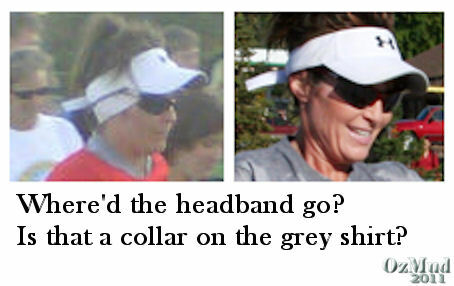 The name Sarah Palin surfaces in running circles for the first time in the 2nd Annual Curtis C. Menard II Memorial 5k/10k run in 2003 held in Wasilla AK. Sarah ran with Todd, Bristol and Willow in the 5k run. 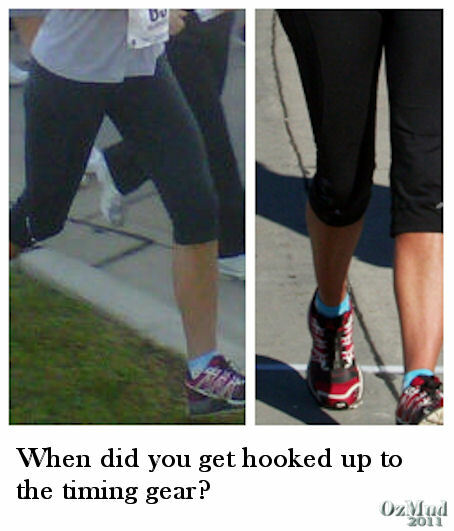 Sarah’s name next appears in 2005 where her recorded time of 3:59.36 set a record in the Humpy’s Marathon. There is no public record of her training for this race, nor have any anecdotes of her training in private ever emerged (that we can find) in Alaska newspapers (not even in Wasilla where she had been mayor for several years). 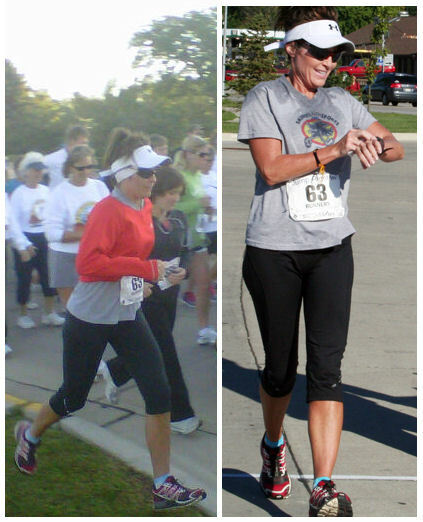 Other than these four events (a 5k run in 2003, marathon in 2005 and two incomplete charity runs in 2009) there are no photo-based stories backing her (many) claims of being a serious runner who for her entire adult life has run “at least 3 miles” per day (whenever she can). She has, however, been paid handsomely for more than one photo op-ed which touts her as such. To maintain a body so disciplined one can – on a moment’s notice – step into a race without the usual physical preparation, even 15 and 20 years after high school, and after having birthed 4 or 5 children to set record times and rake in top medals – one must surely be a profoundly superior athlete. But those of us who have followed Sarah for the past three years just find this explanation – odd. And if that thought isn‘t curious enough on its own, some of us also find it odd that there is no documentation of Sarah’s lifelong journey as an avid runner. None. No team photos from her days in college, no community runs organised as mayor of Wasilla or even as governor of Alaska. In Sarah’s own words I have to run… Sweat is my sanity. This is the age of IPOD. Where’s the candid footage of Sarah doing all this running? Raw talent only goes so far. Athletes who excel in their sport make certain commitments to train, practice and participate in local, state and national events. There is evidence Sarah Palin may indeed have the raw talent but there’s not one shred of evidence she’s made the commitment or puts in the time necessary to turn that talent into record-breaking, medal-winning athletics. “Actually she faked the run in ’05 too. A few years ago when I was looking into the “Humpy’s” race in Anchorage she supposedly ran, I noticed something very interesting in the results. A very good friend of mine (who has been running marathons for years and spends a tremendous amount of time training) was listed as having finished one spot ahead of her. So I called her up and asked her if she knew that she had finished just ahead of Sarah Palin and her response to me was just laughter. She said that Sarah was never in that race. Hey Sarah! About that Marathon… (the agony of d’feet…) Update: a theory 2nd Update: huh? Wasn’t going to post this for another day but since the photos are now up at Storm Lake Running Club and no one seems to be able to find Sarah anywhere but running past the 5k walkers at the starting line and once more at the finish line I thought I might risk being labeled disrespectful in order to share my discoveries. So… once more with feeling. This is the image that has had us all bewitched, bothered and bewildered for a week now. We’ve dissected, lightened, darkened, enhanced and flipped our way around the image until most of us have simply gone batty. A lot of details we thought might be bogus turned out to not be so bogus in the end: The changing size of the runner’s bib, for example, can be explained by how runners check into the finish line and have bottom strips removed for either time confirmation or receipt of participant goodies. 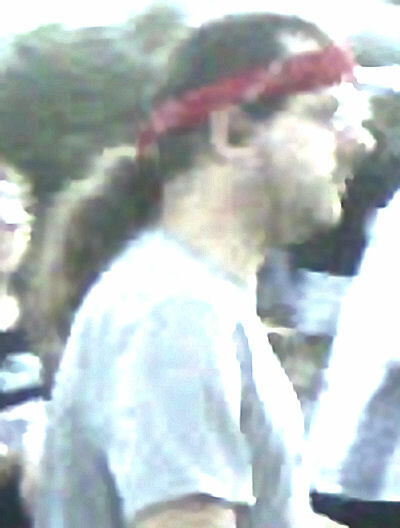 The red shirt and white headband so prominent in this photo yet gone in the finishing line photo can be chalked up to disposable clothing. And so it goes, one by one most of my original misgivings have been satisfactorily explained away. Wait. Not so fast there buster. Like all things Sarah, answering one question only seems to open the door onto a dozen more. So here is the above photo, spliced and copies laid side-by-side for all of you good people out there with younger eyes (than mine) to help me work out which feet belong to which runner and please – where have some of these runners legs and upper bodies gone? The first bit actually hurt my head. (Insert on left, blue outline on right.) Is this a single shoe with either a big sock or leg warmer folded down to cover the entire top of the shoe? Wouldn’t it drag on the ground and possibly catch on something if it were? 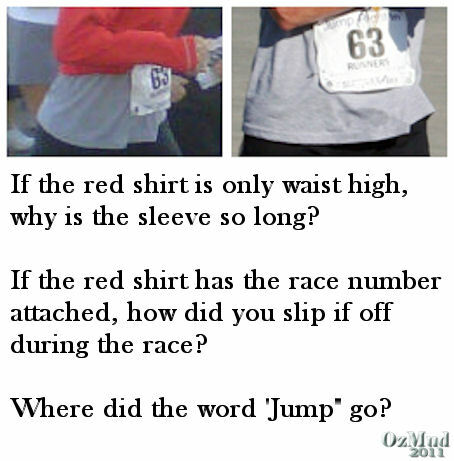 And if it is one shoe why is it pointing more toward the camera than the direction in which the runner is facing? I tried to duplicate this shoe angle and almost fell over in the process. It just isn’t natural. So what if it’s more than one shoe? If that’s not a sock turned down at the ankle, then its quite possibly a second foot (insert on left, pink outline on right) – one that doesn’t seem to belong to anyone in the photo, but will cause this runner to fall flat on his face if he keeps going forward and steps on it. Then, of course, as some of you have already pointed out this poor man’s upper thighs appear to be well – missing with no sign of a right leg upon which to balance his left leg which happens to be very committed in a forward stride. The angle of the leg/ankle/shoe suggests it is more straight than bent but if that’s the case we should be looking at a portion of his right, upper, inner leg under his ever-so-petite buttocks instead of the curb and wheel of a bike or wheelchair. Very curious. The lady we’ve come to know as the bunny hop lady could be running in place, like people do when they’re warming up but what I truly find odd is out of all these people she is the only one looking straight at the camera. This is the image I worked on for a couple of days and I noticed in comments that more of you picked up on this while I was off trying to enhance it. Sadly, my graphics program is simply not capable of enlarging an image to 200%+ and retain its integrity. That’s a problem of a generalized usage of 72 dots per inch – you can only advance so many generations before pixelation makes it impossible to see the image. However, I did try to alter the resolution, in spite of the fact that I don’t have the equipment to do a proper job. In this case however and even just lo0king at the lower resolution I feel there is a compelling case for the white left shoe of the tall runner peeking between the black pants legs to belong to someone else entirely. 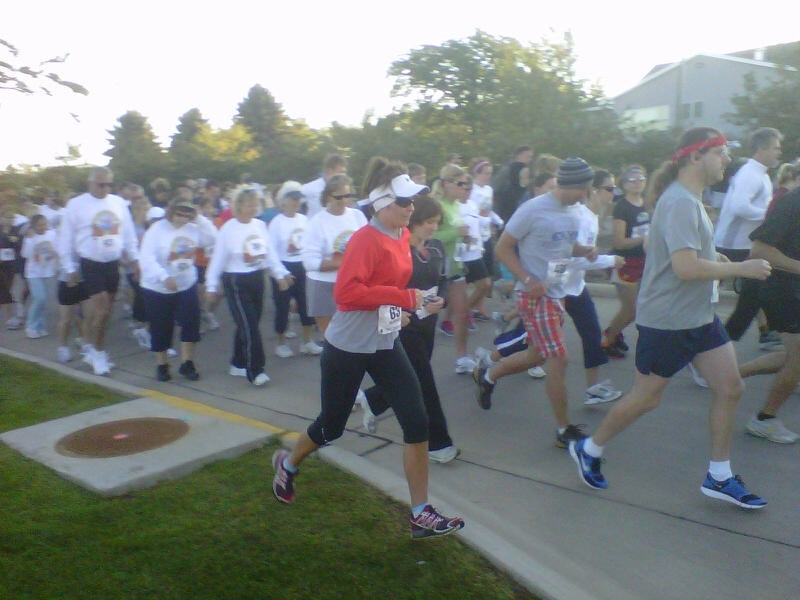 At first glance, the toe of the white shoe appears to belong to the extended left leg of the runner in the white sweatshirt and khaki shorts, to the right and behind the red-shirted runner we politely refer to as ‘Sarah’. Upon enlarging however, there appears to be a second ‘toe’. If it is a second toe that changes everything. If this is a pair of white shoes rather than one left white shoe and a (truly odd) shadow, then the person who owns them is standing perfectly still, completely hidden between the tall runner in white sweatshirt and khaki shorts and the red-shirted runner. And now we come to the observation which I was slow to find but which most of you have already nailed as The Case of the Not-so-Hidden Seam. What are the odds a natural seam in a photo would run almost the entire length, perfectly straight – not one pixel out of line? Have a really good look at the disproportions of objects on the right of the seam compared to objects on the left. On either side of this seam I found a missing shoulder, breast, knee, leg and curb. I also found either a foot way too big for it’s owner or a leg missing it’s foot above a curb taller than the one to the left of it. There is the sole of a grey running shoe that is perfectly straight, not one curve, not one pixel length difference between the sole, the heel, the arch… Follow this line up into the trees in the first photo and then look carefully at the black-hoodie – why is this the only image in the entire photo with no facial features whatsoever? It’s not the farthest-most image. It’s directly in the center of the camera lens. Even the tall runner further behind has a distinguishable brow line and eye sockets. 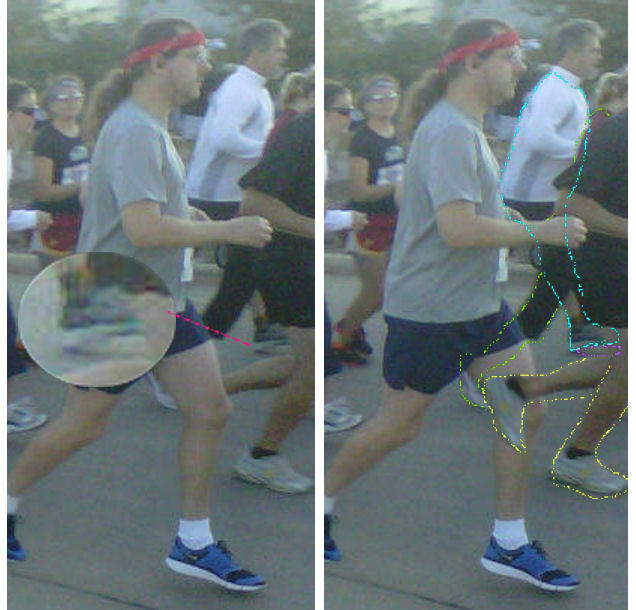 Why is this runner, with the oddly-shaped leg in blue shorts and misshapen shoe, the only runner with no face at all? Okay that’s it – scotch, neat please. And make it a double. The story from the Palin camp is that Todd whisked Sarah quickly off to an awaiting plane after the race – this was the official explanation as to why there was only time for a few folks to have their photos taken with Sarah once it became known she had run the race. And we’ve seen where the toilets were along the route. Where and when did she clean her face adding the fresh make-up we see here? Because Laura Novak is absolutely correct – face and eye make-up do not survive 13 consecutive 8-minute miles. Anyone remember when Sarah made a public fuss over how she didn’t believe Pres. Obama had fairly earned his 2009 Nobel Peace Prize? If running-with-scissors-sarah got one of the top run times, besting most of the runners even those half her age, why is she seen ONLY running at the back of the pack of 5k runners/walkers? The visual of a full sprint Sarah running around the 5k pack into the heart of the half marathon pack would take our attention off her actual placement in the race and focus on the illusion that she runs so fast she could easily pull ahead any time she wanted to not only complete the course but to subsequently win the day. Now any photos published of her with the 5k runners is of no consequence. 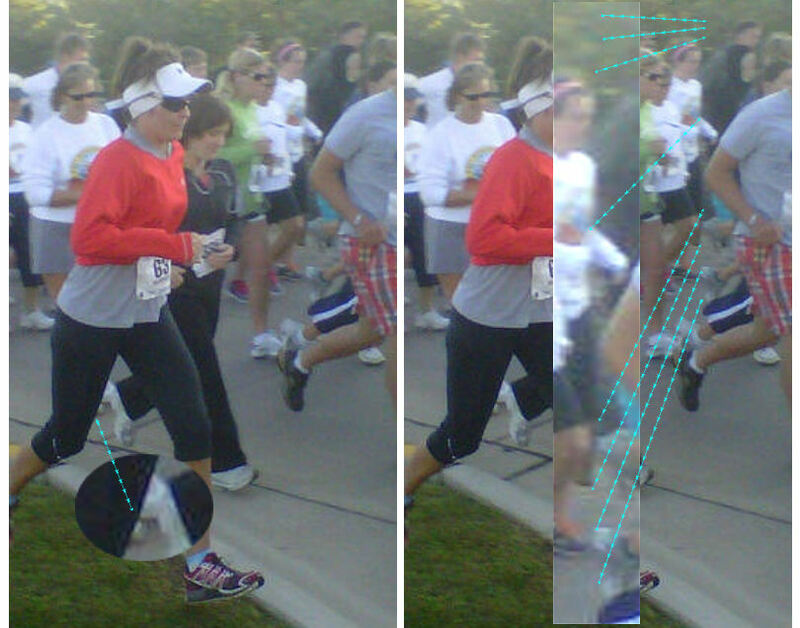 The photo released by Greta Van Susteran on Fox tv is now sold as proof positive Sarah ran the entire half marathon. And the frosting on the cake? The photo-that-wasn’t was strategically placed to show the public that she is physically fit and therefore capable of jumping in at the last minute to win a race and run a country. Except, of course, that’s a lie. Well? Where’s the rest of the pony-tailed runner? I may have gotten some details wrong in my assessment of Sarah Palin’s marathon photos in yesterday’s post, but I was happy to add the corrections that could be proven. And I appreciated all the comments by all the commenters, even those who adamantly disagreed with me or thought my post would make things worse for our cause. Next – for those who keep saying it doesn’t matter if Sarah ran this marathon or not – I beg to differ. It most certainly does matter. Sarah accepted the second place medal. If she didn’t genuinely earn it, she’s stolen it from the runner who did. Athletes have medals stripped from them for cheating and reporters go out of their way to get the stories. Usually, anyway. I’ve only known Sarah to run in two other races during the past three years. Each time there were cameras along the routes and in each she found a way to not complete them. Weird for such an avid runner huh? But here’s a thought – Sarah’s entrance into the half-marathon is being reported as the concept of her PR group. To not have set up staff or fan-based volunteers with cell phones taking action shots of her along the route is just crazy. Those shots would have been money in the bank and votes at the ballot box. If you were her PR man how would you have set this up for maximum return? If someone would be so kind as to demonstrate to me how the earth could possibly have rotated around the sun fast enough to create this humongous difference between the shadows of the first place runner crossing the finish line and Sarah crossing the same finish line exactly 8 minutes later without tossing some of us off the planet entirely- I’m certainly willing to listen. 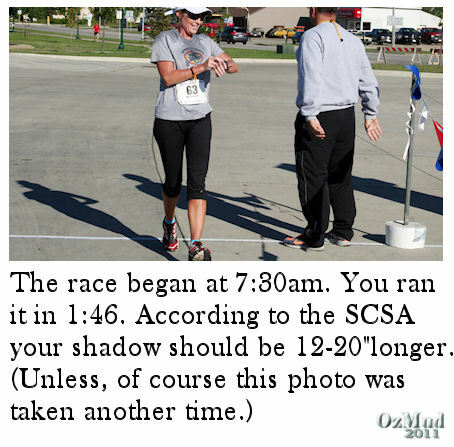 So a couple of photos proving you ran in the half marathon at Storm Lake Iowa on 04 September have flittered about the blogosphere. One made some of us shake our heads, quite sure it had been photoshopped. One made us go oops she really did run it huh? And I must be painfully honest with you Sarah, I really don’t give a crap whether you did or didn’t, do or don’t run at all. I’m quite sure you ran as a young woman and that you enjoyed it and even possibly used running to trim down after each of your pregnancies. (I was a dancer. I danced away all the pregnancy fat after each of mine.) 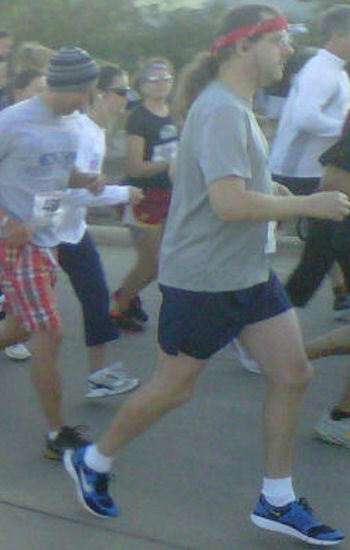 I don’t, however, believe for a second that you run every day now because you’re Sarah Palin. Cameras follow you everywhere you go and not one inch of celluloid showing you running on a remote road (other than those pre-planned runs for photoshoots) has surfaced in almost three years. And I would be quite happy to drop the whole issue except for this nagging feeling in my gut – and a closer look at the photos proffered as evidence of your almost 2 hour run on 04 September 2011. Let’s look at them together shall we? Well I must admit these certianly do look like beginning and ending shots of a runner. Wait. What the… Huh? And doesn’t this picture show the race number as being attached to the top of the red shirt in the front? If it is, how on earth did you manage to slip it off during the race? Lifting it over your head would have pulled the grey tee with it no? And where did the word Jump disappear to? It should be partially visible above the number 6. Shadows? Wait – no shadows… it’s 7:30 am and overcast. Uh-oh – looks like you bumped into some wet paint and stained your nice black pants. What a shame!. They look great on you! Surely you didn’t stop during the race and take them off and then put them back on back to front did you? No wait that wouldn’t work. If you’d put them on backwards the paint stain would shift to the back of your leg. Well that’s certainly a head-scratcher! 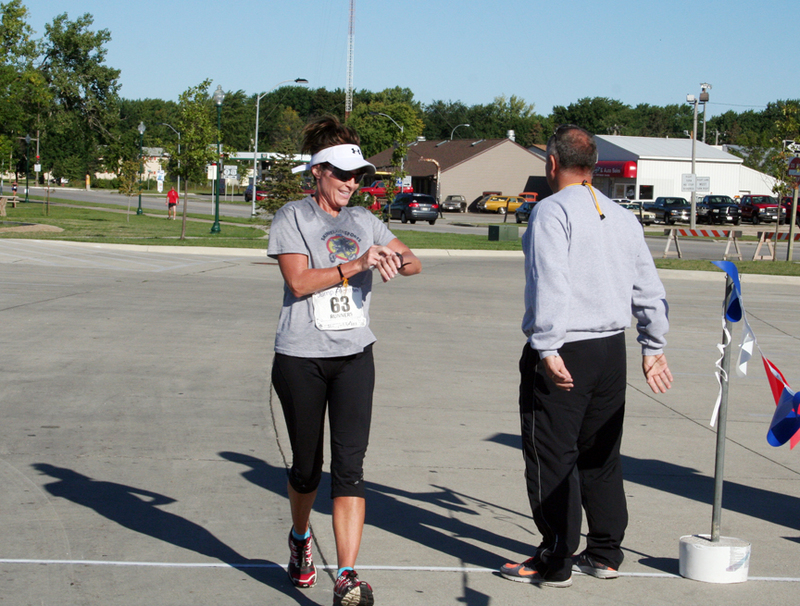 And if you did this during the race, how would it give you an accurate time at the end? You’re really a Houdini at heart aren’t you! …did you know one can tell the time of day a photo was taken by the shadow the images cast? You need to know the city and state, the height of the image and the ratio between the shadow and the image height. And I guess I’m also a bit befuddled at the whole lack of people in this second photo. I’m sure you have a reasonable explanation but really Sarah… where are all the folks who drove, flew, trained, biked and bussed themselves in to see you at this shindig? One would think that fans willing to spend several hours on freezing nights in shopping mall parking lots just to get a glimpse of you and a signed copy of your book would surely be patient enough to wait one hour and forty-six minutes for you to run a race and be there at the finish line to cheer you on? But there’s no one. Just the nice man waving you across the finish line. That is what he’s doing with his arms, right? Waving you over the line? Well no, that would be silly because you’re just walking calmly checking your time. He would surely have relaxed his arms by now, wouldn’t he? Ok Sarah I’m signing off now. Can’t wait to hear all the explanations come out of the woodwork. You need to know though Sarah, that if you actually did run the whole race and in one hour and forty-six minutes, that these badly staged, after-thought photos injected to ensure we all see what you want us to see rather than just showing us the naked truth from the beginning are just the kind of thing that make most of us disbelieve you in the end. When I see video footage of you running through an entire race, then I will happily concede. Until then – for me – this was just another phoney image you dreamed up to give yourself a legitimacy you didn’t earn just to fill your wallet.